Taking its name from the Greek word ‘epidosis’, meaning ‘addition’ or ‘increase’, this mesmerising crystal suggests there could be some exciting news about a pregnancy, engagement or birth this week! Pay rises, promotions and bonuses can also be expected, and there could be an exciting opportunity for you to boost your finances too! Celebrate all the luck and happiness around you by keeping an Epidote in your home, or placing one beside a plant pot. Synonymous with love, healing and forgiveness, this stunning crystal suggests you may find yourself feeling slightly tearful about the past this week. Painful memories from your childhood - and dreams about people from the past - may leave you feeling very vulnerable, and you may find yourself feeling slightly self-conscious around other people too. Calm your heart and mind by holding a Rhodonite by your heart, or keeping one under your pillow. This mesmerising crystal is often associated with the Greek Goddess of Harvest, Demeter - who is thought to have been so heartbroken when her beloved daughter was abducted by an evil god, she left the world in complete darkness! Like this kind-hearted goddess - who was eventually reunited with her daughter - this enchanting crystal suggests there could be a heartwarming reconciliation between two people around you too this week. Prized for centuries, this beautiful crystal is often associated with the Greek Goddess of Magic and Witchcraft, Hecate. Like this clever goddess - who is often depicted stirring a cauldron - this stunning crystal suggests someone may try to ‘stir’ trouble between you and a friend or Ioved one this week. Protect yourself from their bad vibes and negativity - and bathe your heart in positivity- by keeping a Smoky Quartz in your home or work place. Known as a stone of love, healing and protection, this spellbinding crystal suggests you may find yourself feeling slightly worried about someone around you this week. Distant behaviour from friends, colleagues and loved ones may leave you feeling slightly unsettled, and you may find yourself feeling very drained by a very one-sided friendship too. 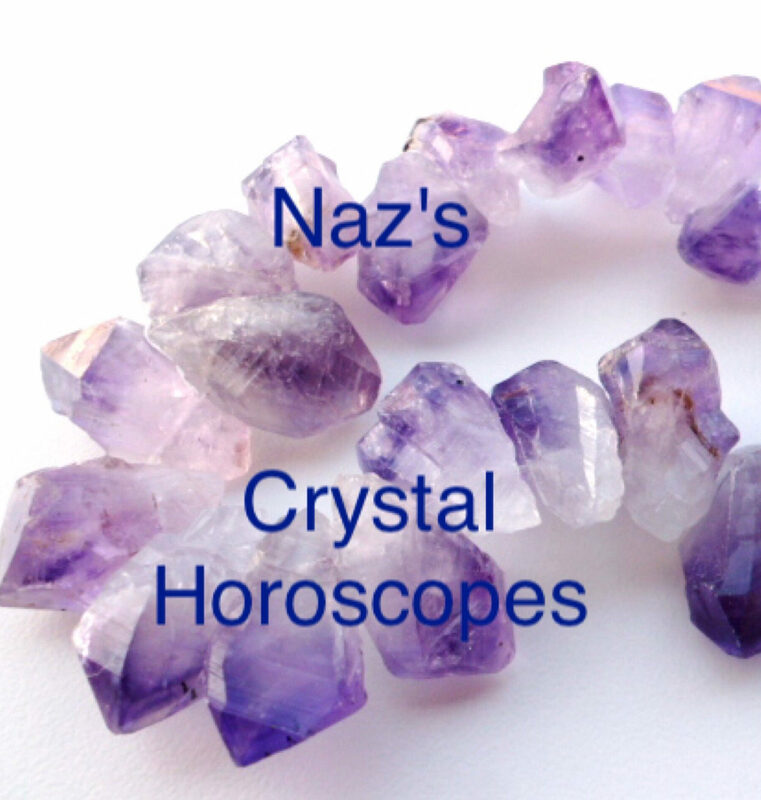 Keep your spirits high by placing an Amethyst in your home or work place, or simply keeping one with you each day. Synonymous with healing, this stunning crystal is thought to take its name from the Hebrew word ‘Malachi’, meaning ‘messenger’. Known as a stone of love, healing and letting go, it suggests you could receive a really touching message from someone you love this week. Unexpected messages from ex-partners and childhood friends can also be expected, and someone could surprise you with a very thoughtful gift or gesture too. Known as a stone of friendship, this spellbinding crystal is thought to help with everything - from attracting friends and protecting your family, to boosting your luck and super-charging your creativity! Prized for centuries, it suggests you could hear some exciting news about a friend, colleague or family member this week. Celebrate all the love and happiness around you by keeping a Turquoise in your home or work place, or simply keeping one with you each day. Prized for centuries, this spellbinding crystal was highly revered by ancient warriors - who believed the gem would help them defeat their enemies in battles! Symbolising strength, courage and inner belief, it suggests you may find yourself feeling slightly anxious about the future this week. Worries about finances - and fears about losing the people you love - may leave you feeling very unsettled, and you may find yourself feeling slightly paranoid about your friendships too. Like this beautiful crystal - which is so often mistaken for gold - this stunning crystal suggests you may need to be very careful about what you say to a very two-faced person around you this week. Snake-y behaviour from friends, colleagues and family members may leave you feeling very angry, and you may need to distance yourself from a very toxic person too. Prevent their bad vibes and negativity from draining your energy by keeping a Pyrite nearby. Like the beautiful sun it’s named after - which so selflessly shares its light with the world - this enchanting crystal suggests someone could try to take advantage of your giving nature this week. Greedy behaviour from friends, colleagues and loved ones may leave you feeling slightly used, and you may need to stand your ground with a very rude or tactless person around you too. Wave their negativity goodbye by keeping a Sunstone nearby, or holding one by your heart. Symbolising love, luck and friendship, this beautiful crystal represents the start of a truly wonderful cycle in your life. New relationships, friendships and job opportunities can all be expected, and the bond between you and a friend or loved one could strengthen too. Nurture the bonds around you - and leave any negativity behind you - by placing a Jade crystal in your home or work place, or simply keeping one with you each day. Known as a stone of courage, confidence and inner-belief, this mesmerising crystal suggests you may find yourself feeling slightly overshadowed by someone around you this week. Loud or overly-confident behaviour from friends, colleagues and family members may leave you feeling slightly intimidated, and you may need to distance yourself from a very unhealthy relationship too. Keep your confidence high by keeping a Tiger’s Eye nearby.